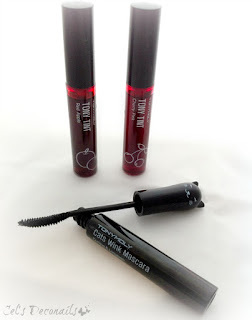 I am starting today a new series of posts where I will talk about some of my favourite cosmetics brands. 10 years ago I was introduced to Asian beauty brands from a dear friend and it was a turning point for me as they have since become my weapon of choice so to speak. 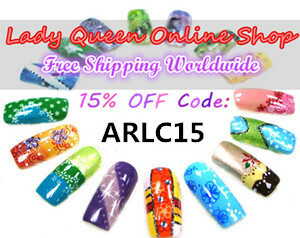 They have great variety, awesome application and results, good combination of quality and price and super cute packaging. What's not to love, seriously! Since this month's theme is kawaii, I had to start with a brand that I consider to be super cute, Tony Moly. Let's start with the skin care products. Can you guess what the beauties below are? Certainly not fruits. Let's remove the lids and see what's inside! 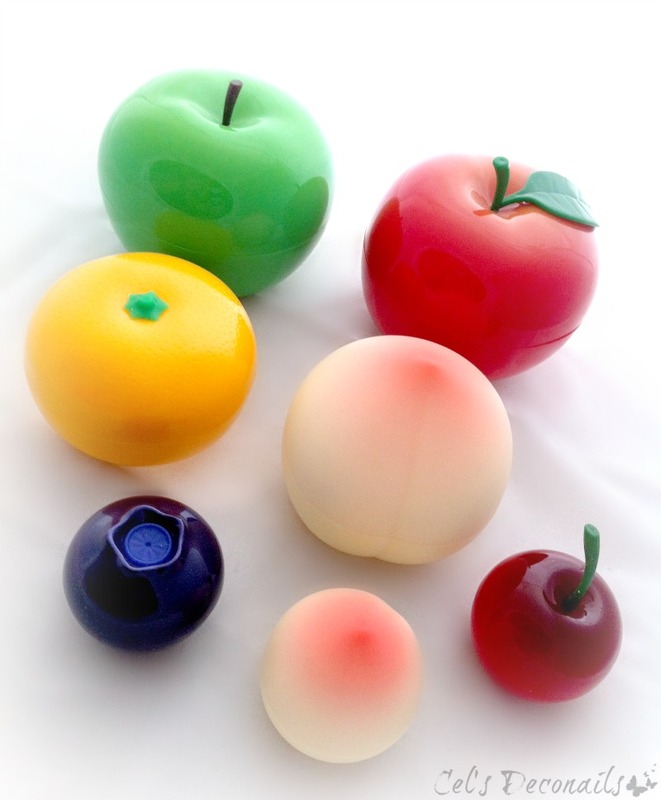 The two apples on the top are from the Appletox series. The green one is a peeling cream and the red one is the honey face cream. 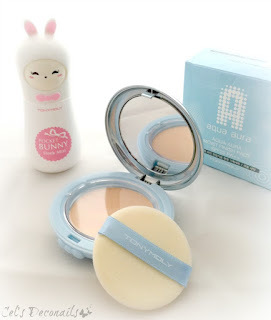 These two are my favourite TonyMoly products and part of my current face routine. The face scrub is nice and works like any face scrub you might have tried. Nice smell and good results. The face cream is absolutely fantastic. It has a sticky texture and a divine apple smell. You are supposed to pat it on the skin until it is absorbed and it gives a great fresh feeling of hydration afterwards. I am very pleased with it. The big peach is an anti-aging mosturizing hand cream. I don't know about the anti-aging part but it is indeed hydrating and has a lovely smell too. 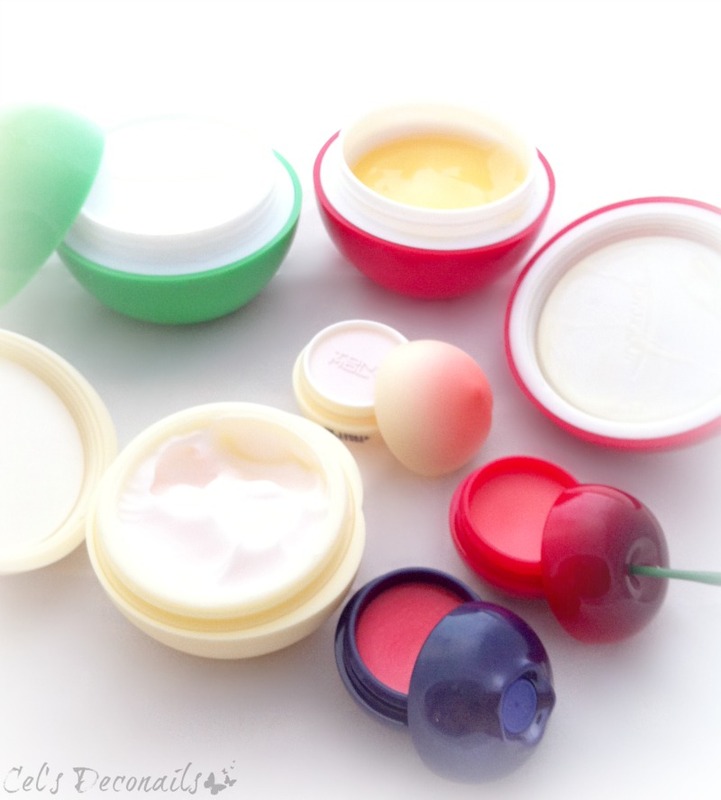 And the three little fruits are lip balms. I haven't tried them yet but I can tell you they all smell lovely. Another product I use a lot (mostly during the summer) is the Pocket Bunny Mist. I have the oily skin version. Also pictured is the Aqua Aura compact with 25 SPF. I picked this up during my recent trip to Hong Kong but I haven't tried it yet. What impressed me though was the fact that it is sold with a free refill. A field where I feel Tony Moly is an expert, is lip products. I usually don't like lip glosses and lip balms and I find them too sticky and annoying on my lips but all the Tony Moly lip products I have tried don't bother me at all! 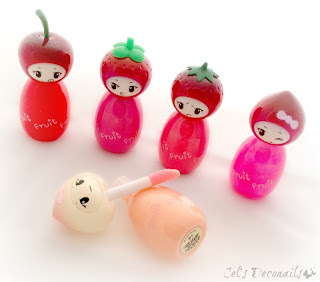 I will start with the Tony Moly Fruit Princess lip glosses. The first thing I noticed was the super cute packaging and ok I admit it, that's why I got them XD They all have different fruity smells and give a glossy look to my lips. So a win win product. 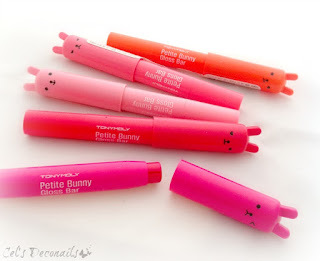 My absolute favourite though are the Petite Bunny gloss bars! I adore these! They hydrate my lips and keep them from getting dry in the cold, and the more intense coloured ones give a hint of colour too! I highly recommend them! If you are looking for something more intense, try the lip stains, conveniently called Tony Tint. 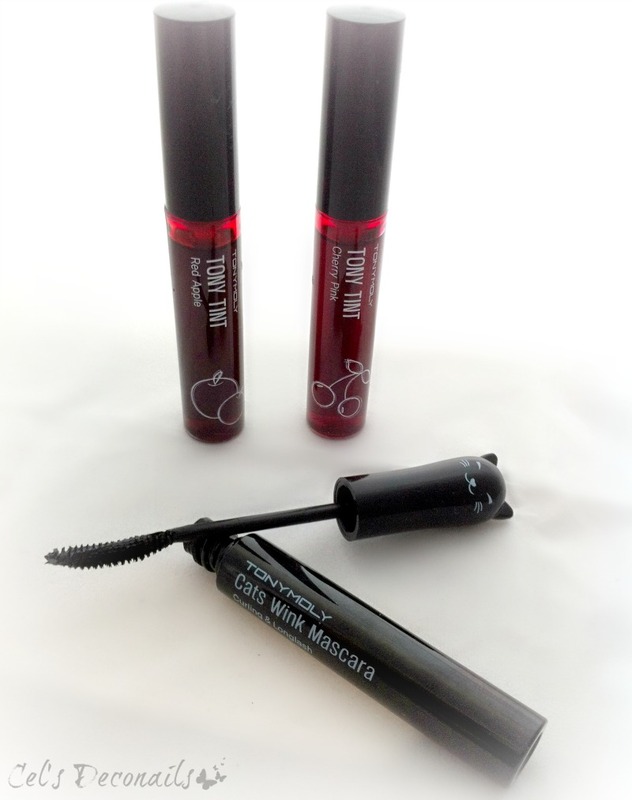 They give long lasting colour and are very easy to apply. They remind me of Benefit's Benetint. Also if you want to try the gradation lips look that is big in Asia right now, these lip stains are perfect! You can also see here the super kawaii Cat's Wink Mascara. I love mascara brushes like this and I use this mostly for everyday looks when I don't want my lashes to be too intense. Last but definitely not least are the nail polishes. 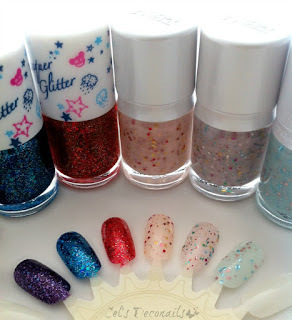 Of course I had to choose all the glitters as I do not care much for ordinary creme polishes. Here is my small Tony Moly nail polish collection. 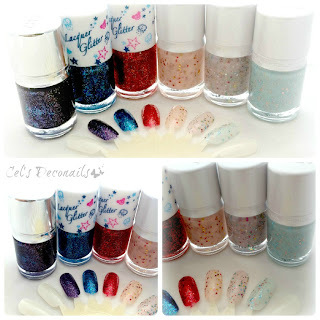 I swatched them all on a nail wheel, two coats each without top coat. I have not heard about this brand nor do I own anything, but my dearest friend, they are so damn cute, and I want them all! I mean even if my skin didn't like them, I'd still have them to pretty up my room! Gaaaaaaah Cel, you'll make me go ebay hunting at 2 am. And that's why I love you! Hehehe I am trying my best to ruin you! But they are so cute and good quaility and what's not to like really? I really love the lip stuff especially the bunny gloss bar but I haven't opened my mascara yet although I really want to try it out. Ahhhhh I cannot get enough of Asian brands! I feel they combine everything, quality, price and cute packaging!!! I plan to review many more brands! I love the Petite Bunny gloss bars that yo gave me! I want them all! They are amazing. I also want to try skincare products. Πολύ καλή ιδέα να μας μιλήσεις για τις εταιρίες που γνωρίζεις και εμπιστεύεσαι!! ^_^ xairomai pou sou arese kai to xrisimopoieis. Einai apo ta agapimena mou proionta. Cute blog post! I've managed to get a few Korean make up pieces from eBay and now I want to buy everything in this post. I love the fruit shaped pots, but haven't bought them yet as wasn't sure if the product would be any good. Ebay is such a life saver as travelling to Asia to get all this beauties is not the easiest thing in the world. I hope my review has helped you decide whether or not you want to buy any of these. OMG!! 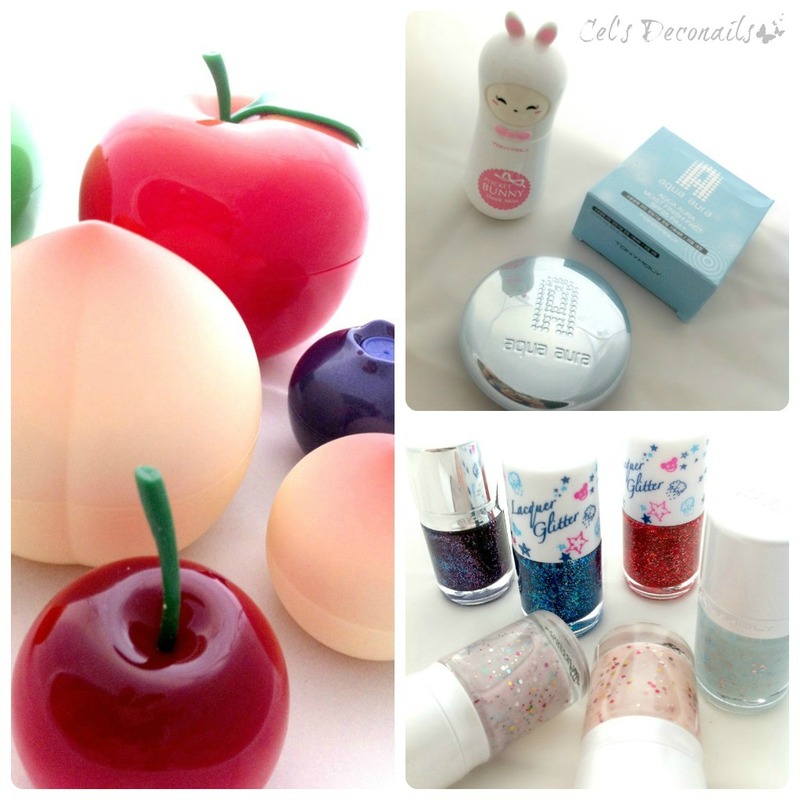 Never thought that Tony Moly's products are so super cute! Και μετά από όλα αυτά με τι καρδιά να ξαναπάω για ψώνια στο ταπεινό Cosmos; Τώρα που χρεώνουν και το παρκάρισμα; Αχχχ όλα φωνάζουν το όνομα μου δυνατά και καθαρά.